Life can be painful if you do it right. Anyone brave enough to love another person, anyone who loves enough to take onto herself another person’s pain and fear, anyone compassionate enough to feel the pain of all that is wrong with our world, learns how challenging life can be. Sometimes the heart that opens itself to love becomes so overwhelmed with the feelings to which it has made itself vulnerable that it breaks. Terry Wise’s true story, told here in narrative form to streamline her experiences, is the story of a heart that broke from the pressure of too much love and too much pain, and of a brave therapist who was willing to open herself up in order to put that broken heart together again. Terry is, of course, the central character of the book. We follow her descent into hell, the depression that followed her young husband’s agonizing death, her wish to follow him into that oblivion where there is neither love nor pain, and her slow, faltering return to life and to a readiness to live and love again. But Dr. Betsy Glaser, Terry’s therapist, is similarly heroic in the book. Though some of the names are invented, the dialogues between Terry and Dr. Glaser have the ring of truth. I have known many therapists, personally and professionally, and I can appreciate how fortunate Terry was, at the lowest point of her life, to find herself in Dr. Glaser’s care. No one comes to see a therapist to tell them how happy they are. There was a time when therapists were expected to secrete themselves behind an emotional curtain and not let themselves become emotionally involved in the lives of their clients. After all, they deal with so many emotionally troubled people, all of them desperately needy. Fortunately Dr. Glaser chose not to abide by that rule. She dared to care. She dared to venture outside the box of standard clinical protocol, making herself available. Rather than simply presiding over Terry’s voyage of self-discovery, she took Terry’s hand and accompanied her on her journey. 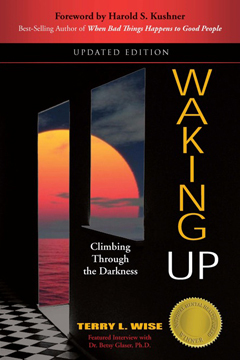 What will you gain by reading Waking Up? You will read a gripping story. You will find yourself cheering for Terry with every tentative step she takes to return from death to life. But more than that, there are life lessons here for us all. You will learn that heartbreak need not be a fatal condition, that a broken heart, like a broken leg, hurts terribly but ultimately can heal. You will learn something about the incredible resiliency of the human heart and soul. There are people for whom the pain of life is just too much and they break under its impact. But there are people who can survive the worst that life can deal them. Sometimes the secret of their survival is an inner strength that they always had but never knew they had. Sometimes it is a strength they borrow from someone else. Waking Up is the story of a brave woman who dared to love and found that love left her abandoned in the valley of the shadow of death. And it is the story of a courageous therapist who dared to care about that woman, to lend her strength until she grew strong enough to continue on her own, to believe in her despite everything, until she learned to believe in herself, who took her by the hand and led her out of the shadows and into the sunlight. It is the story of a journey that teaches us how hope and a thirst for life can be restored. We will read this story and perhaps we too will be less afraid to love.